"Have you ever sat down at your desk in some anonymous, beige office building, sifting through Excel spreadsheets and realizing that you'd give just about anything to be on the Cape with a beer and a pair of Croakies?" Whether you answer "yes", "no", or "which beer? ", your pants won't hold up themselves, so check out belts from Tucker Blair. Blair's a DC-based e-purveyor of needlepoint accessories for the jauntily self-assured, whose page-long mission statement kicks off with the above soul-searcher, then moves on to weighty subjects from "Nauset Beach", to "Colgate", to "strolling". 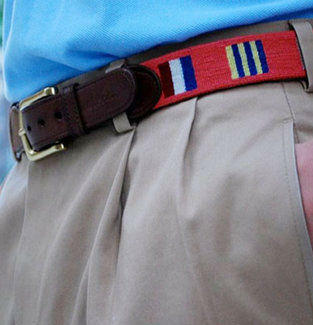 Among the ten new belt designs are "Race Silks", adorned with jockey costumes, "Fly Fishing" with red & blue fish on the line, and the stick/helmet patterned "Lacrosse", so you'll fit right in when your lax friends start pooping on "Long-stick Middies", at least 'til it becomes apparent you think they're talking about well-hung Navy football players. 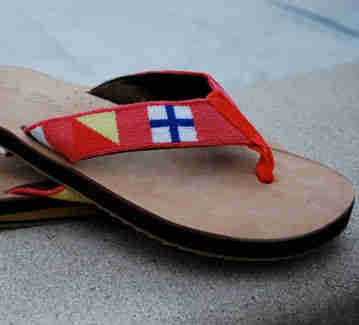 Also ready to take a privileged place in your privileged life are similarly patterned key fobs, headbands, and dog collars, plus leather-soled flip flops with strap designs like nautical flags and beer an' crab; the one clothing piece is the "Classic Chatham Polo" (in "Atlantic Blue", "Bermuda", and "Coral"), with an embroidered Mallard on the breast and on the back under-collar, the latter revealable with a pop -- tricking people to say "duck" even as they move to punch you in the head. Because not everyone can be into stick-sports and sailing, Blair will also do custom designs catering to your own unique vision of the life you deserve, like sitting with a beer and pair of Croakies on...the Vineyard.